SARASOTA, Fla. /Florida Newswire/ — The October Florida Justice Association’s Masters Of Justice conference was attended by several partners from the personal injury law firm Shapiro Goldman Babboni Fernandez & Walsh. Held at the Ritz Carlton in downtown Sarasota the conference featured dozens of seminars on a wide variety of civil trial law topics. Headlining the conference were several advanced lectures including a presentation on auto accident representation entitled “Winning From The Beginning” given by attorney Keith Mitnik; a lecture on defective roadway infrastructure entitled “Defective and Improperly Installed Guardrails” given by speakers Leslie Kroeger and Poorad Razavi; and a seminar on Life Care Planning after a severe injury entitled “Truth, Lies, Myths, and Legends,” given by Dr. Santo Steven BiFulco, a CLCP of BiFulco Medical Group in Tampa, Florida. Several members of the Personal Injury Law Firm Shapiro Goldman Babboni Fernandez & Walsh were in attendance including Attorney David Goldman, Attorney Stephan Fernandez, Attorney Bernard Walsh, and Attorney Daniel Murphy. Attendees received presentation materials useful for a variety of case types and could potentially earn up to 17 Continuing Legal Education (CLE) Credits during the conference. In addition to the educational value, attendees also were able to network with other members of the Florida Justice Association and stay up to date in many areas of civil trial law including auto negligence, insurance bad faith and medical malpractice. The event also featured the 5th Annual Diversity and Inclusion Reception. This year’s reception honored retired Florida Supreme Court Justice James E. C. Perry. Nominated in 2009 by then Florida Governor Charlie Crist, Perry was the 85th Justice to the Florida Supreme Court. Other notable guests of the Reception included The Honorable Charles E. Williams of the 12th Circuit Court of Florida, who serves on the Sarasota County Bar Association’s Diversity Committee, and Christina Walsh, secretary of the Tampa Student Bar Association and former FJA liaison to Cooley Law School. Attorney David L. Goldman had this to say about the FJA conference: “Events like the Masters of Justice held by the FJA are a valuable tool in the effort to keep our civil justice system strong. Over the past several years lobbyists from the insurance industry and many other special interest groups have used the present political climate to weaken consumer protections in the name of jobs. More often than not these efforts to influence our state legislature have led to higher corporate profits, reduced protections for our citizens, and little in the way of good paying jobs. Mr. Goldman is a member of the American Association of Justice, the Association of Trial Lawyers of America, and the Southern Trial Lawyers Association. Mr. Goldman is an Eagle Member of the Florida Justice Association and the Academy of Florida Trial Lawyers, and received the prestigious Legislative Leadership Award by that organization in 1997. David Goldman has a long-standing commitment to the community and has served as a board member of many civic organizations. He has worked extensively with the Gulf Coast Latin Chamber of Commerce, the Sarasota African-American Chamber of Commerce, Second Chance Last Opportunity and the Westcoast Center for Human Development. He has also served on the Board of Directors of the Sarasota-Manatee Jewish Community Center and has been a director and member of the Endowment Fund of his local synagogue. 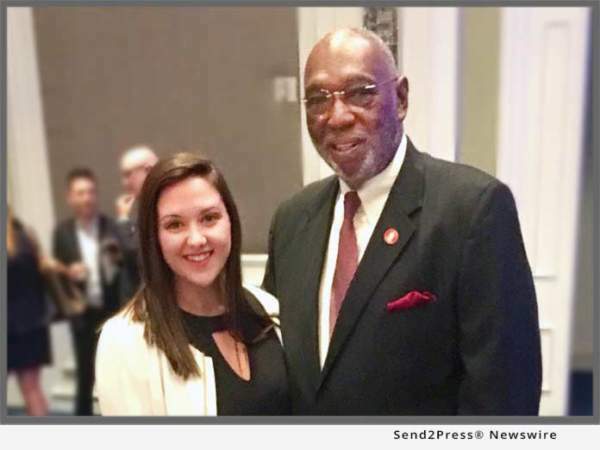 *PHOTO Caption: The Honorable Charles E. Williams of the 12th Circuit Court of Florida and Christina Walsh, secretary of the Tampa Student Bar Association and former FJA liaison to Cooley Law School.